Two awesome performers visited us this week. On Saturday, nine-year-old guitarist Roberto Granados treated us to a concert of classical, flamenco and rock songs (including Led Zeppelin, Jimi Hendrix and Neil Young). He was warmly received, and his performance received a standing ovation from the crowd. Magic Alex was as magical as ever and received help from several audience members with his tricks on Monday. He even instantly transformed one of them, Jordan, into a magician! 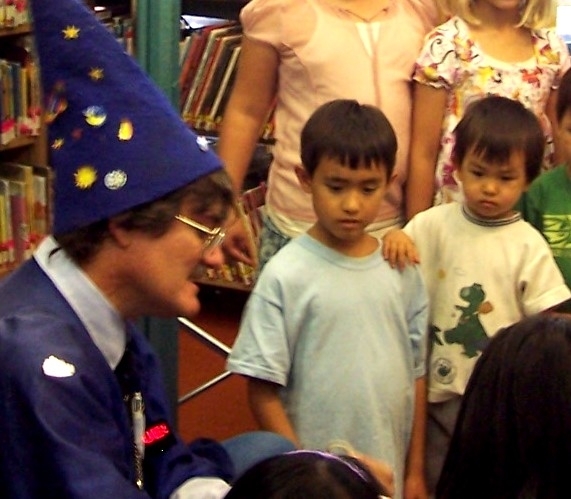 Alex told us about how he learned his first magic from books, and how he got his start by performing in libraries. We hope to have both performers back when we have our new library next fall! 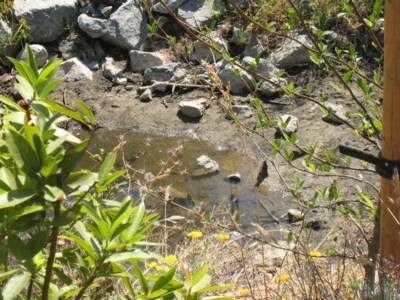 If you’ve been by the new library site lately, you might have noticed that the Creek is pretty dry this time of year. Sylvia Tedesco sent this poem a long suggesting that we post it near the creek. Construction is going full steam ahead. June activities included completion of layout and footing evacuation, beginning work on foundation rebar, and installation of foundation embeds for steel. July construction activities will include ongoing pouring of concrete foundations, continuation of underground electrical and plumbing work and continued excavation of 11,000 tons of soil from the building pad. 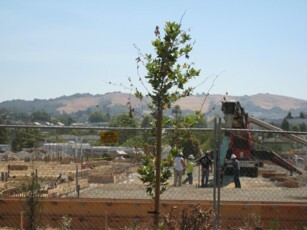 And soon you will be able to watch ongoing progress through a webcam link from the Castro Valley Library website. There are just a few more weeks left in the Summer Reading Game. Hurry in to claim your prizes! I’m sure many of you were here recently for the Astro Wizard and for “Insect Songs” with Sandi and Stevie. We have a fun lineup of shows still to go on Mondays at 2pm. 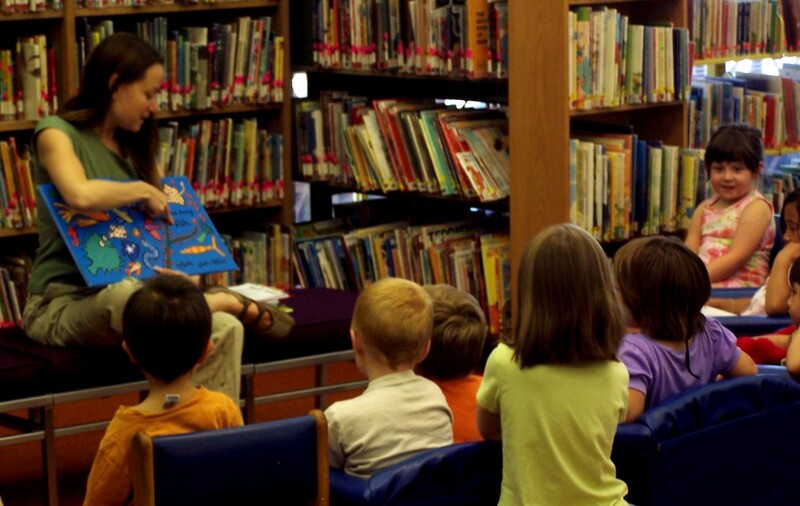 Reading Buddies are here Thursday afternoons from 3:00-5:00pm. (Hint: you can count the minutes toward your “Catch the Reading Bug” game!) Just drop in! 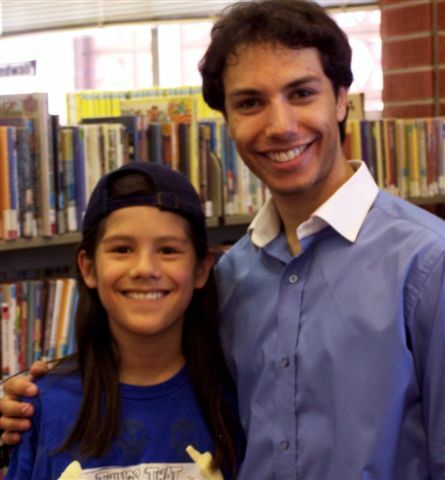 We also have a special program with nine-year-old guitarist Roberto Granados on Saturday, July 26th at 2pm that will entertain and amaze you. Roberto is scheduled to be on National Public Radio’s From the Top this fall. Join us! More and more students are getting a jump start on the school year asking for math review books, and CVHS students entering AP English are coming in with book lists of Classics they must have read before school even starts! More than 85 tween (6th through 9th grade) Kid Power Volunteers are helping with the Kids’ Summer Reading Game. Over 1,200 children are signed up to play, and as of today at least 264 may have enjoyed their first level prizes of a free Round Table pizza, or taken a trip to the Lawrence Hall of Science or the Schulz Museum! Twenty-five high school students have volunteered for community service and show up at regular one to two hour shifts to help with simple shelving and straightening up. And, you know what else? Community members are finding it’s nice and cool in here compared to the scorching outside temperatures this week! On Saturday, racers buckled up for almost 2 hours of shell shooting, mushroom zooming, high octane action as local teens challenged eachother in our Mario Kart Tournament. The action was fast and furious as the teens battled it out, 1 on 1, in a best of 3 competition before advancing to the next round. The “Moo Moo Meadows” and “Rainbow Road” courses proved to be the most popular choice amongst courses, the latter of which often offered very entertaining races due to the fact that the racers kept falling off of the track and plunging to their doom. When the tournament was over we set up some 4 player racing action that was an absolute blast. There was a lot of hoot and hollering and playful trash talking, and if the noise coming from the room was any indication, everybody had a lot of fun.